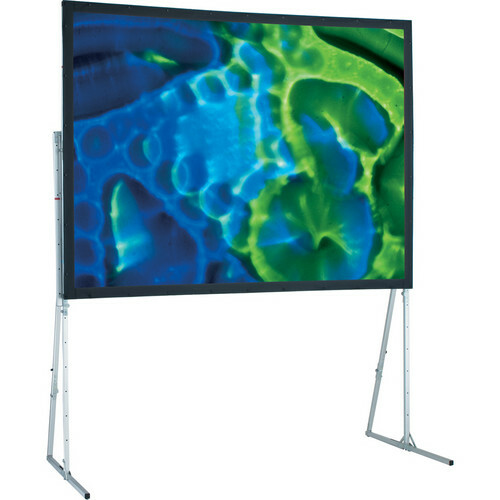 The Draper 104 x 136", Ultimate Folding Screen has become the standard in portable folding screens. It is a unique development that is manufactured through 100% CNC (Computer Numerical Controlled) components and assembly. The tubing is CNC machined, surfaces and borders are CNC cut; even rivet and snap holes are CNC placed. This screen serves well for point-of-purchase displays, gymnasium presentations or any venue where a permanent screen installation is not needed or possible. It is also good for anyone who travels and doesn't want the headache of having to rent a screen on location. The system has been enhanced with a beefed up Lock & Latch mechanism that facilitates ease of handling and makes the frame more solid. The Latch has been changed to an internal connection for additional security and resilience since it cannot be dislodged. Setup is easy and break down is just as simple. Along with all this comes a rugged polyethylene wheeled case with molded steel handles that makes transportation easier -especially in hallways, parking lots and airports. In addition, the case is secured using two strong adjustable straps. Note: Draper Euro Dress Kit Skirts are specifically designed to fit European format screens. Euro skirts will NOT fit conventional domestic screen sizes and formats. Neither will domestic skirt bars fit European skirts (and vice versa).